Just a quick note for those in or near the Edinburgh Festival that Gareth Williams, the author of the recent "A Monstrous Commotion", will speak on his book this coming Monday. Further details can be found here. The animals in Loch Ness were even well known enough to be mentioned in the Glasgow Evening News in 1896. No more is said by Costello and since then I have been left somewhat in limbo wondering what was said in those times about Nessie? Henry Bauer, in his "Enigma of Loch Ness" expresses frustration that Costello did not provide more information while arch-sceptic Ronald Binns, in his "Loch Ness Mystery - Solved", dismisses it as another example of so-called poor research by Nessie believers. I had not resolved the issue in my book, "The Water Horses of Loch Ness", but by chance, the matter came to the fore during a visit to a bookshop on the Isle of Lewis in July. As is my wont, I went to the relevant section of the shop to check out publications relevant to folklore, legends and cryptids. There the matter resolved itself as I flicked through a book published in 2006 called "Strange Things" written by John Campbell and Trevor Hall. 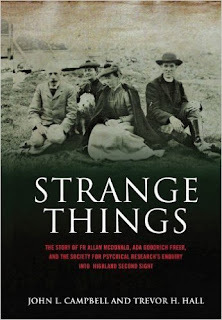 This book is subtitled, "The Story of Fr Allan McDonald, Ada Goodrich Freer, and the Society for Physical Research's Enquiry into Highland Second Sight". However, the findings of any such enquiry were never published, most likely because there was nothing to publish. Suffice to say that Ada Freer was the woman charged with going up to the Highlands to do the investigation. Also the uisge-each, as Miss Fiona MacLeod calls the water-horse in Gaelic which will bring a blush to the cheek of Celtic modesty, still cavorts in Hebridean meadows at nightfall, and Loch Ness is full of water-bulls. But none of these manifestations is, we fear, for a lady interviewer with a kodak. To them must be brought the eye of faith and an hereditary nose for the uncanny gifts that stenography and the snapshot lens are poor substitutes far. This would appear to be our 1896 Loch Ness Monster reference, or as they called it in those days, the Loch Ness Water Bull. The Glasgow Evening News is not available online (though it is available as microfilm in the Glasgow Mitchell Library). However, the Oban Times was also available on microfilm at the National Library of Scotland, which I occasionally frequent. So, I consulted the quoted Oban Times for 26th September 1896 to see the original source (shown below). Zooming in on our target text, shows it has been correctly quoted in Campbell and Hall's book. As an aside to researchers, the Oban Times is also available online, but a text search revealed none of this story. One can only presume this issue missed the scanning process. So another vague reference to the Loch Ness Monster is solved. But how did Peter Costello know about this source? 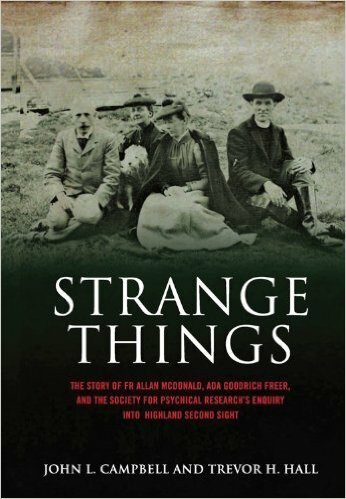 The answer is that "Strange Things" was first published in 1968 (cover below) and so someone with a common interest in the paranormal and Nessie must have tipped off Costello and the Loch Ness community in general. My money would be on Tim Dinsdale, who was known to have an interest in both mysteries; but that is merely a guess. What can be said about the actual Loch Ness reference? The first thing to note is that when the famous Water Horse (or Bull) of the Highlands is mentioned, out of all the many lochs in Scotland, the author plumps for ..... Loch Ness. Why am I not surprised? And this is 37 years before the Loch Ness Monster turned up. Having studied the various references to loch monsters in pre-1933 literature, Loch Ness dominated and this article from 1896 just confirms what is known already. Nessie is the dominant lake cryptid as it was the dominant Kelpie in the 19th century. Secondly, Loch Ness not only had a Water Bull, but it was "full of water-bulls". This may be a reference to a similar phrase from folklorist, John Campbell of Islay. But it tells us this was more than just a passing reference or an obscure tale from ancient times, but repeated, multiple stories of something strange in Loch Ness. Again, why am I not surprised? Of course, sceptics today will pooh-pooh all this as just tall tales and mythology. Mind you, don't they say the same thing about modern reports? The problem is that critics expect something akin to a modern plesiosaur-like sighting report, but from Victorian times. That is not the way it works. People back then expressed what they saw in their cultural terms, just as people do today. However, underneath all this was the same, unknown creature. What further does not surprise me is that once again the newspapers of the time poured disdain on such a beast. The phrase that will please hardened sceptics is "but none of these manifestations is, we fear, for a lady interviewer with a kodak ...". In other words, the newspaper author does not expect these creatures to be real. This confirmed my prior view that Victorian newspapers did not take these things seriously and hence did not publish accounts. In summary, John Keel's story about the Atlanta Constitution's Nessie story was wrong. However, the reference to the Glasgow Evening News' Loch Ness monster was true. One could complete the loop by consulting that edition of the Glasgow Evening News published some days before the 26th September 1896. However, I do not anticipate that the Loch Ness reference there will differ at all from that in the Oban Times. Therefore, I am glad to add this reference to the growing list of pre-Nessie Nessie accounts! If you want to control what people think, then you have to control what they read. That's a well enough established fact from history and today I learnt something new about scepticism, especially as it appertains to the Loch Ness Monster. You won't be surprised to know that the wikipedia page on the Loch Ness Monster is one of the most visited pages by people wishing to learn more about the monster. Up until a week ago, there were some references to my work on it, which have been there for years. However, somebody by the name of "Bloodofox" decided they should no longer be there and edited them out. This came a week after I had given a highly critical review of Darren Naish's "Hunting Monsters" on Amazon. Coincidence? Maybe not, but for now I am not discounting it. On 12 November 1933, Hugh Gray was walking along the loch after church when he reportedly saw a large creature rising from the lake. Gray took several pictures, but only one was successfully developed. The blurry image appeared to show a creature with a long tail and thick body on the surface of the loch. Although critics have claimed that the photograph is of Gray's Labrador Retriever swimming towards the camera (possibly carrying a stick), researcher Roland Watson suggests that there is an eel-like head on the right side of the image. This is the first known photograph of the creature. The oldest manuscript relating to this story was put online in 2012. Gutted non-academic, cryptozoology/pseudoscience, dead, and amateur monster hunting websites (definitely not reliable sources). Clarity—a tiny portion of people out there are "cryptozoologists", most simply encounter the being in popular culture. Do I think this guy has an agenda? You bet. Now I can hear the excuses already. Wikipedia only deals in facts and so all this cryptozoology and pseudoscience should be censored. Actually, the deleted text suggesting an eel like head is visible in the Hugh Gray photo is not pseudo-science. There is an eel-like head visible in the photo. Now whether one wants to put it down to paredolia or a real fish is a matter of opinion. Visitors to the Wikipedia page should be told this and given the opportunity to make up their own minds on this. Just because a sceptic finds it inconvenient, is no reason for editing it out. You control what they read, you control what they think. The Columba edit actually makes no argument for or against a monster, it just links to my article. But, since that article argues that Columba saw the same species of animal that we today call the Loch Ness Monster clearly rankles with our sceptical editor. Actually, a look at his Wikipedia profile shows that he is interested in folklore but does not like cryptozoology. Doubtless, he has his own opinion on what Columba encountered and does not want more exotic interpretations to "pollute" people's minds. You control what they read, you control what they think. Now I wouldn't care if someone edited in arguments that the Hugh Gray photo only shows a dog or a swan. I wouldn't make any censorious attempts to edit them back out. They may be no more than speculations, but in the interest of freedom of speech and disseminating opinion, they should be there. That also applies to opinions which are cryptozoological in nature. You control what they read, you control what they think. Scepticism just plumbed new depths this week. Given one of my favourite pursuits is tracking down old stories of monsters in Loch Ness before the modern Nessie era, this seemed like gold dust. But no one had ever found it and I stated so in my book, "The Water Horses of Loch Ness". Henry Bauer said he had scanned every issue from November 1896 and found nothing. I concur with this, having done the same via online resources recently. There is nothing from that month that bears the slightest resemblance to a monster in Loch Ness. Naturally, sceptical books from Binns' "The Loch Ness Mystery- Solved" in 1983 to the recent "Abominable Science!" have latched onto this as proof of poor claims on the part of Loch Ness Monster researchers. They don't, however close the book on this story. That can now be done. The solution was simple, having an online resource, change the terms of the search and another issue with the image below turned up. Do we have a woodcut image as described by Keel? Yes. Do we have Nessie like images? Yes. Is this part of a full page article? Yes, this is a full page article, but it is not on the Loch Ness Monster. It is from the Atlanta Constitution issue of May 2nd 1897 and is titled "What We Know of the Sea Serpent" and draws on the work of A. C. Oudemans' prior book, "The Great Sea Serpent". The full page is shown below. Keel had got his dates wrong. The issue he had in mind was six months later. Moreover, the article was not on Nessie, but her marine relation, the sea serpent. Keel made an honest mistake and misremembered what he had seen; possibly years later. If he had made a note of the date at the time he was going through the microfilm, the issue would have been resolved and put to bed a lot earlier than August 22nd 2016!